I made this wall hanging for the Cotton on Quilters exhibition in March. The challenge fabric was the spots on the giraffe and the leaves on the tree lots of fussy cutting. To see the winning quilt visit here. 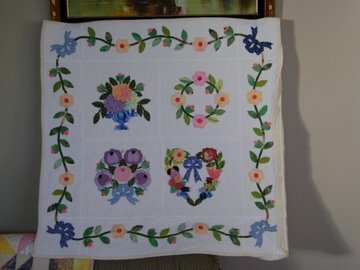 You can also find a link on Janice's blog to a slideshow of the quilt exhibition. So many quilts & so little time to look at them all. In the photo you can see some of the other entries in the challenge. Hi! Greetings from Finland! The quilts are fantastic! It was very nice to see your Blog! Have a nice day!